﻿We were blessed to see the Lord do exciting things all the way through our whole time there. We began to feel God’s drawing to go back to Europe on yet another mission trip as summer approached, yet we didn’t have the funds necessary nor anything set up ministry-wise there. Nevertheless, we felt God leading us, so we took a step of faith and booked some one-way tickets. Not having the return set up was another step of faith in itself. Once we stepped out in faith to go, we had some spiritual warfare. This, along with the fact that the breakthroughs we prayed for tarried as the departure date drew closer—the Lord sometimes has us wait and stretches us a bit before things come together—caused us to feel the sweat beading up on our foreheads. As the days drew near for our departure, we kept praying for the provision we needed. ﻿Europe has been recognized by many current mission organizations such as the US Center for World Mission as a continent that has fallen to the state of being the world’s least evangelized continent while other continents like Africa and Latin America have surged ahead dramatically over the past decades. (As a point of reference, compare the fact that Brazil has over 15,325 Foursquare churches while France has only 9 Foursquare churches.) Thus, the Lord has burdened us for renewal in what should now—instead of Africa—be called the dark continent. The light of ages past has been dimmed by the spread of extreme secular humanism, agnosticism, atheism and the like; thus, the need for renewal amongst the struggling churches is great. Then, out of nowhere, a friend who lives in Europe sent us an unsolicited donation saying he felt it was meant to be for a European ministry trip— pretty solid confirmation there. We still needed to seek God’s direction for what we would do once we got on the ground in Europe though. Then, again at the last moment, a couple of days before we were about to take off, we were contacted and asked to come preach at a church in London. Some friends who are Londoners let us know a little later on just what a miracle that was! Churches there (and throughout Europe) schedule things far in advance and are not typically open to these last minute types of things. Stoked to have the doors open at the last minute, we arrived and had an awesome move of God at the church when we preached. In fact, three of the co-pastors sons were filled powerfully with the Holy Spirit—one of them only 6 years old and the two others in their teenage years who were also struggling in their walk with God had amazing breakthroughs to the whole church’s delight. Many others were also impacted and touched and filled, and a few made re-dedications to completely following Christ. A pastor who was visiting that church in London who had come from France asked us if we would preach in his church in Paris later on if we went to France. We didn’t have any plans set yet, but said if we got there we’d be fully up to it. After we preached in London we then saw a few sights in the historic city. We were stoked on the timing of coming to England since we both had been researching and studying the English Reformation throughout the last year. After seeing London we felt the Lord leading us to set out for the countryside, praying as we went along seeking God’s will for what was next. We really didn’t know if we’d be in England just a few days or more, or what God had in store. We had some amazing times seeing the country, a first-time experience for both of us. We ran into amazing sites and old castles, like the one that George Fox, the leader of the Quakers—a charismatic group out of the English Reformation—was jailed in for his faith. We were praying about the next step and felt we should contact a guy we had just been told about by a friend of ours who we knew through Lonnie Frisbee. It turned into a divine appointment meeting with Davey “Grace” in Wales and we hung out—drunk in the glory of God—all day long. As we left, he gave us a number of a friend of his in Newcastle who he said we should contact if we got up that way. We did eventually make it up to Newcastle, not knowing what to expect. We contacted Davey’s friend—calling someone you don’t know out of the blue always feels a bit crazy—who responded so awesomely by setting up some ministry meetings and then giving us a place to stay. We had some very powerful moves of God in the meetings we did. In fact, in the first meeting we had barely walked into it through the door when they started asking us questions and had us share straightaway, which somehow led right into a powerful ministry time that had us all getting hammered by the presence of God before we knew it—seems like God snuck up on us before we were even ready on that one. 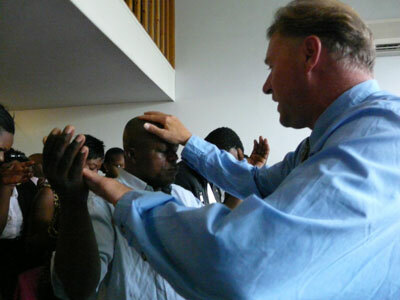 We continued to have other powerful visitations of God’s presence while there. We also got to see some awesome sights in that area of Northumberland: We were blessed to do some hiking along Hadrian’s Wall which was built by the Romans as well as visiting Lindisfarne Island, one of the ancient centers of Celtic Christianity and origin of the Lindisfarne Gospels. The island is also known as the place the Viking Age began in Europe, after the first Viking raid on Lindisfarne in 793 A.D. It was such an awesome time to visit the famed island where so much history has taken place. We headed briefly down to Southport to connect with another old friend and Lonnie Frisbee connection from years back. The Lord just blessed the time so awesomely with His presence and we had a great time as we reflected on that radical past of the Jesus People and the Third Wave Revival which was marked so much by Lonnie’s ministry. We were also blessed to visit the Lake District along the way, one of England’s most beautiful and scenic areas. We had more ministry later in the Darlington area as God opened doors down in the North Yorkshire area. We had some awesome moves of God down in that area, and then the Lord did an amazing thing by supernaturally opening another door. The sister we were staying with in Darlington called a pastor of a church in Hollybush. She talked with the pastor who said he had a very strange situation: there was a preacher scheduled to speak that night, who for some weird reason hadn’t confirmed that he was coming. The pastor told us to just come over to the church that night and be ready for anything, whether it be just giving a short testimony or preaching the whole service. The mysterious unconfirmed preacher never did show up, and so at the very last moment the pastor had us come up and preach the entire message for the whole service—this was quite miraculous that it would work out that way because the church in fact was quite large (for that area) with over 250 people, and England, as well as most European churches are not known for being so extremely flexible like that. We had an incredibly awesome and powerful time preaching and then praying for so many people at that church, and God just continued to pour His power out late into the night. Many, many people were touched in an incredible and powerful way as we received many awesome testimonies of those who were filled, empowered, ministered to deeply, and healed. We also were blessed to get some surprisingly good surf along different parts of the coast of England, including Cornwall, North Devon, Wales, as well as on the East Coast, which was quite miraculous as that area rarely gets good surf. 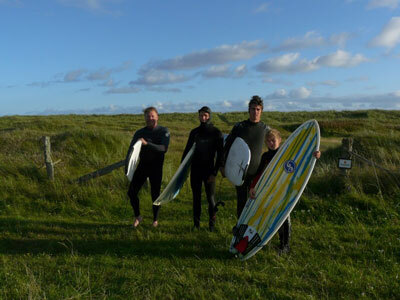 We got lost in Wales, and then somehow ended up at a great point break where we got some great surf—wow! At one point, we went to meet with a Polish pastor when we were on the East coast to go fishing, but big waves had come in all a sudden and we couldn’t’ go out to fish at all. Instead, we got great surf—on the East coast by Sunderland no less, a part of the country that faces the mainland of Europe. Not only did God open so many unexpected doors in England in all these different places, but then the people we were staying with asked us about our further travels and said they could get us across the channel to France for free with connections they had, if we were planning to go in that direction. 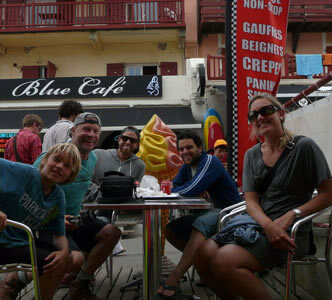 We hadn’t decided where we were going next, but things in France were coming together. The French pastor from the church in London had just written to us asking if we would preach on a weekend coming up and then other churches opened up and we realized the Lord was leading us to France. ﻿We crossed the channel taking in the white cliffs of Dover as we pulled out of England on the ferry. 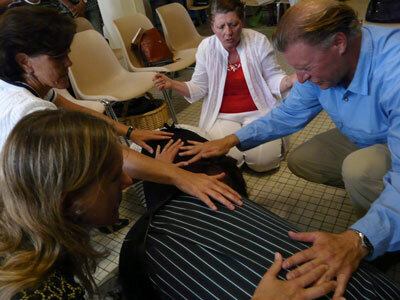 We could feel the shift of the spiritual climate as we headed into France. Though a beautiful country with many great people and accomplishments, the spiritual atmosphere is quite dark. Landing in Calais we were blessed to visit historic Normandy where the allies had landed in WWII. We were so impressed by the great sacrifice of American, British, and Canadian soldiers to liberate the European continent from the Nazis in WWII as we visited some of the war museums. In fact, we had been receiving quite a download from the Lord on the necessity of sacrifice to be able to have liberty, when we came headlong into the dark spiritual atmosphere of the land. We were just pulling out of a parking lot quite slowly after our time at Normandy, when a speeding wild motorcycle plowed right into us. It was quite a traumatic moment as the rider got up and came on the attack “like a wild demon.” It felt like a dark “Welcome to France” moment from the devil. It shook us all up quite a bit, to say the least. That night, both Patrick and I had the same dream of the same thing—being taken up a high mountain by an angel to a waterfall—and felt like the Lord was saying he was taking us up to a higher level…However, with new levels come new devils! It seemed clear we were experiencing some serious spiritual warfare having just arrived in France, and it became even more apparent as we began to minister in the city of Tours why the enemy was coming against us so hard. The Lord poured out His power so dramatically as we ministered that even the pastor, who happened to be interpreting, was radically overcome by the presence of God and knocked to the ground and was unable to get up. The Spirit of God moved with radical power throughout the whole church touching so many there with awesome power. Many made rededications and received healing power as the presence of God filled so many with His power and glory. We had more outpourings when we ministered with another congregation in Tours, and then in Paris, where we ministered for the first time. This was the pastor we had met in London who invited us to minister at his church in Paris—God was just arranging our schedule as we went along. We were stoked to see the Spirit of God poured out in power and glory with so many filled, empowered, and healed by God’s presence in the city of lights. We were also blessed to connect with a few bro’s down on the coast from Christian Surfers and catch some French surf together. God also gave us quite a few divine appointments as we took in a little time on the French coast catching our breath from all we had been doing. One divine appointment happened when we met a guy distressed over a relationship with his girlfriend who was studying in the US. He approached us when he heard us speaking English and asked if he could use our cell phone to make a phone call to his girlfriend. We helped him call and then talked with him a while as well as praying for him right there on the French boardwalk in Biarritz. 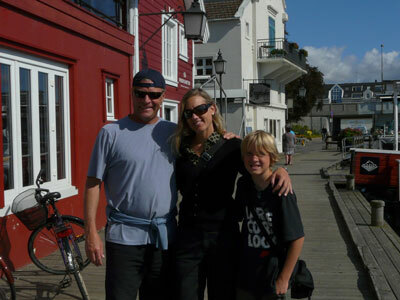 ﻿We had even more crazy spiritual warfare when we stepped out to go up to Scandinavia. First, we encountered a bomb scare at the airport right at the very moment we began to check in that had us waiting forever. They pushed us out to the far reaches of the airport that delayed things for a long time. Then later, after the bomb problem was ‘detonated’—they blew up the bag, whatever was in it—unbelievably, just as we were getting on the plane, the airline made an announcement that the pilot had gotten sick and couldn’t fly all of a sudden. We were turned around and herded back into the airport where we were stuck for several more hours. The airline finally rerouted us to Stockholm, which was not where we were scheduled to land, and then left us stranded without further travel onwards. We were forced to spend more money on train tickets. We had already bought some for our original landing destination in Copenhagen but couldn’t use the tickets now since we were in the wrong city. After a long battle with SAS airlines that went nowhere we now had to fork over more money on expensive train tickets. SAS refused to fix the situation they had created with their pilot, who decided not to fly at the last second—who knows if he was really even sick—nothing but warfare! We finally just broke down and bought more tickets and boarded a train. When that train broke down in the middle of our ride after all that happened already in one day, we were in stunned disbelief –can so many things really go that wrong in just one day? Obviously there were unseen forces we were battling. We began to realize that God must have some big blessings in store in Scandinavia if there is this much battle and spiritual warfare just getting there. We changed trains and finally arrived to our destination in Sweden exhausted from a 14-hour trip—longer than it took to get from the US to Europe—that should have taken just 4 hours! The next night we went straight into a meeting at a new (to us) church that had really promoted the meeting, even advertising in the papers and making special announcements about our coming to minister, and we ended up having a good size turnout for the meeting. 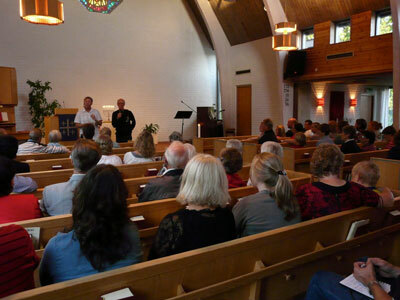 Our friend Leif who would be interpreting had advised the church not to have an end time to the meeting so that the Holy Spirit could be allowed to minister as freely and as long as needed. 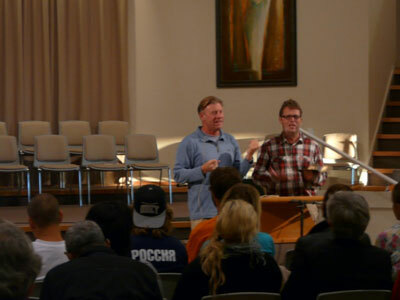 Leif had been involved in meetings we did in the past and was familiar with the way the power of the Holy Spirit had touched people with such intensity when we ministered before. Leif’s advice to the church was followed, and it showed itself as wise counsel as the meeting went on and on into the night with a very dramatic move of the Holy Spirit over what seemed like pretty much everyone who came. The Spirit of God ministered so deeply and powerfully that it was just amazing. The priesthood of all believers being equipped for ministry was a theme the Lord laid on our hearts while in Scandinavia. Our friend Jonathan received a scripture along those lines the first night and the Lord kept confirming it. We were excited to see God empowering people with His fire and power in a glorious manner with young and old being equipped for ministry themselves by God's presence. There were also healings the Lord brought forth while in Scandinavia: There was a young friend who got touched radically in Sweden by God's power, in fact he was on the ground getting blasted by God's presence and overcome by the love of God for a very long time. He told us later about how he has had asthma but last time we talked with him he told us how he's been running and biking since with no problems. Also in Norway we had a man with heart problems who we prayed for in a meeting who reported back later that he felt significantly better. He was so blessed when we prayed for him that he went out and prayed for someone else on the street who was powerfully touched too. Another minister who has had serious throat problems was touched and came back to tell us that he felt significantly better after we prayed for him also. We had some powerful meetings with a church in the city of Mandal in the southern part of Norway, where God really poured out His Spirit and touched and ministered to many people. We have received reports back from our friend who is the pastor who told us that the church has a new dynamic of being revived and empowered and has new life since we ministered there. We also did another meeting in Norway with about 35 to 45 young adults and teenagers in the town of Kristiansand and quite a few there got radically touched by the Lord and filled with the fire of God. The Lord also poured out his love and grace very significantly on some in a healing way, and it was wonderful to see the Lord moving in such an awesome way that we continued to minister late into the night since it was a home meeting. We got to perform some songs and worship in a church service; every meeting we've done has had significant moves of the Holy Spirit with the glory and fire of God being poured out in power. We were also blessed to have a little R and R in Scandinavia: We were able to do a little surfing in Norway after some hunting for the elusive North Sea waves, and also got to do bit of hiking as well. Some friends in Sweden took us out for a few days of rest on their sailboat too. We really appreciated this after traveling for over two and a half months in Europe where we'd had incredible blessings everywhere we'd been, but also experienced the warfare wearing on us. Just getting into Scandinavia turned into a literal nightmare with the bomb scare and sick pilot and then being rerouted to the wrong destination and left by the airlines stranded and then a broken train. Looking back, we can see that the opposition came as God had so many blessings in store in this region. Not only are there blessings in store for Scandinavia but the whole of Europe as well. I remember driving in Eastern Europe in the pastor’s car I was borrowing and hearing the words from a tape stuck in the deck from Rheinhard Bonnke, who declared loudly over and over: “Europe shall be saved! Europe shall be saved!” We are reminded of Argentina when we survey the land in Europe: Argentina was one of the toughest places spiritually in Latin America, and yet later had one of the biggest revivals. Nothing is impossible with God! All in all it was an awesome trip with so many blessings and miracles and signs and wonders; it just amazes. Though it cost us a lot financially and physically with all the expense and warfare—we appreciate your support as we are still paying off some bills from train tickets and the accident—it is all worth it because we are sowing the Good News with signs and wonders and miracles leading and following us each step of the way!! !